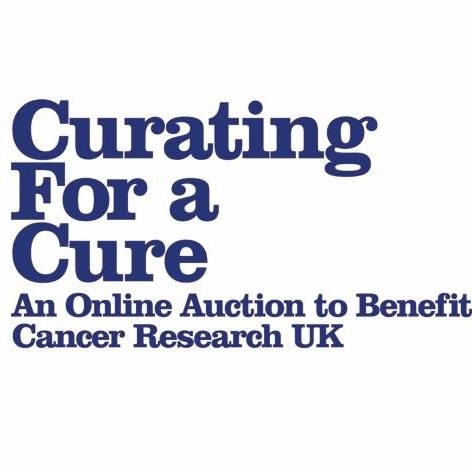 We would like thank all of the kind artists who have donated their wonderful art to Curating For A Cure - you've done us proud! Charlotte O’Brien drew from models in magazines, fascinated by the unrealistic quality of their flawless skin and glossy hair. 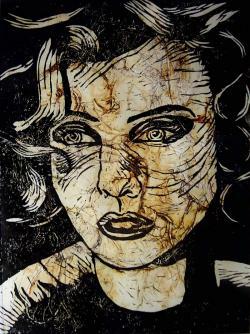 Lino and collagraph printing enabled her to create textured surfaces which juxtaposed well with the stiffness of the models’ pose and expression. She liked the unpredictability of layering the two print techniques, especially the patterns and detail visible in the ink. Charlotte is a freelance artist from Lancashire and also teaches art to secondary school students. Ross Howard is a Fashion Buyer with a history in Textile & Print Design; and has a MA in Textiles & Fashion. His work features only in small private collections and has been awarded prizes and commendations for his work with textiles for Fashion and homewares. Print and Pattern play important roles in his work – he plays with surface, pattern and texture to explore memory and often works into pieces many times over to layer elements together. Decay & Hidden Imagery are major themes within his work; through extreme abstraction, and conversely intense detail, he works in mixed media to use the canvas as a space or window for memory – capturing a snapshot of something at once completely alien, other, and fantastical, yet intensely familiar to the viewer through his use of common visual elements, shapes and motifs. Framed Photo emulsion transfer onto calico with machine stitch overlay. 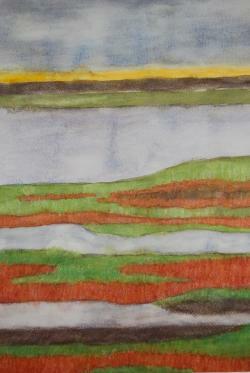 Gillian Vipond is a teacher of textiles and art and likes to focus her own work on local photography, using mixed media, including textile techniques to create contemporary, textural artwork. Image size 24 x 33cm plus mount 46 x 35.5cm. After moving from Wigan to Bondi Beach in Australia to pursue his career as an art teacher and his love of surfing, catastrophe struck when Pete Conroy had a surfing accident which left him with a broken neck and paralysed from the chest down. With his career over but his love for painting still intact, he re-enrolled at university to obtain a Masters in Fine Art and to learn how to paint again. Ever experimenting with process and technique, Pete always produces several lines of work at once. 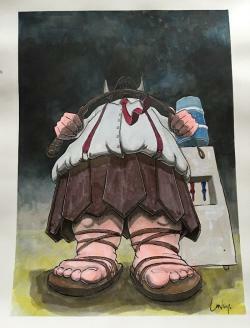 From his watercolour and ink illustrations for books and publications, political and satirical oil paintings exploring subjects as varied as exponential growth and spinal cord injury, or his latest body of work which revolves around beach and surf life, Pete is at his most content when he is producing work. Currently undergoing his 3rd exhibition since his accident, Pete is slowly making the transition from amateur painter to professional artist. 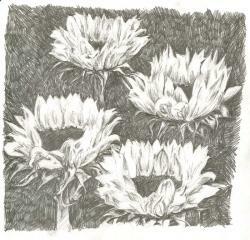 ‘Sunflowers’ is a tonal drawing of four flowers looking into the sky. The golden colour of the petals has been removed to give them a new meaning. Freddy Fuller is an illustrator from Lancashire. He was recently awarded first prize in the Absolut at New Designers Competition in London with his portrait of Drag King Stormé DeLarverie. He was also first runner-up in the Little White Lies portrait competition. 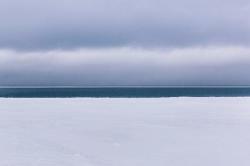 Special Edition Series: A series of photographs selected and printed especially for the Curating For A Cure Auction. These images are taken from Lisa’s forthcoming book, ‘The People of India’. Description: A man taking a Holy dip in the river Ganges at sunrise. Many people bathe in the Ganges everyday and repeatedly submerse their full body in the river water. Hindus believe this will cleanse them and ‘wash away’ their sins. Description: Every day at sunset in Varanasi, the Grandeur Evening Aarti Ceremony take places. It is a ceremony to worship the Ganges and to show respect for the life it gives. This is a photograph of one of the Holy Men performing the evening worship. Description: Local men enjoying the sunrise over the Ganges. Boats are vary popular in Varanasi and many local men spend all their time on their boats, even sleeping there. They use them as a means of transport and income. Lisa Anne Maisey is a Graphic Designer and Travel Photographer from Warrington, UK. She has travelled to over 10 countries for her travel photography. She has designed one travel photography book called ‘Miles Apart’ and is currently working on a new book, “The People of India”. Originally trained as a fine artist Penny Horsefield has spent much of her professional life in art education whilst practising art. She mainly works across textiles and fine art moving ideas through 2D and 3D using digital manipulation as part of the translation process. 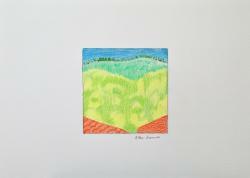 Penny enjoys combining natural forms and man made structures to form colourful 2D images. She currently works from a studio in Hoylake. Most of her work is private commissions for individuals or small businesses. Solar Plate etching Framed. Limited Edition 1/5 21 x 14.8cm. Janette M. Byrne‘s interest in Art covers many aspects of both Contemporary and traditional works. She has a B.A. (first class) in Fine Art and M.A. (distinction) in Fine Art (as well as a B.Sc. in Zoology). 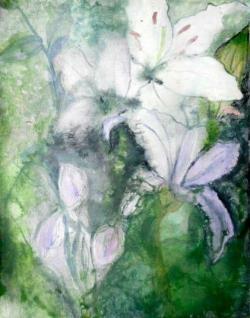 Her studio is located at neo Artists in Bolton. 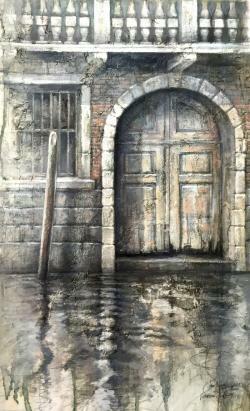 Janette’s interests are largely figurative and are inspired by old black and white photographs and Childhood memories. Janette has exhibited in Manchester, Liverpool and throughout Lancashire and Cheshire and also at the Royal Academy in London, having had 5 selections through to the Second Round in the past 3 years, one of these being exhibited and sold in 2014 Summer exhibition. In May 2016, artist Lauren Wells attended a 1-month artist residency in Filignano, Italy. There she made daily landscape drawings and architecturally inspired, pattern drawings from her third-floor studio. The view captured in Studio Drawing May 4, 2016 looks east from a balcony, overlooking the surrounding mountains. Captivated by this mountain range, Wells frequently returned to the same spot to make her drawings throughout the month. Studio Drawing, along with other drawings from the series, will be edited into a collection of prints and an artist book for publication and exhibition in 2017. 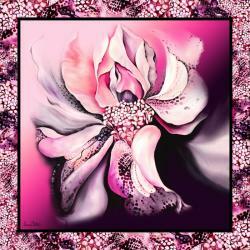 The print entitled ‘Camellia’ is taken from an original oil painting that focuses on the hybrid mix of a study of orchid and rose species of flowers. This piece captures Claxton’s long-time passion for exploring the delicate intricacies of the floral world. ‘Camellia’ reveals enigmatic patterns hidden behind clusters of unfolding petals. Artist and print designer Leanne Claxton graduated from Central Saint Martins in 2006, after taking one year out to train in Paris under Christian Lacroix where she discovered haute couture and the relationship between art and fashion. Since graduating Claxton has worked both in-house and as a freelance print designer for major brands in London, Paris, New York, Hong Kong and Spain. 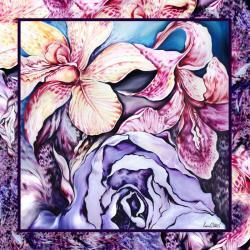 Leanne Claxton began printing her floral oil paintings onto scarves as a way of making her paintings more accessible. Uniting art and fashion as one, the artist embraces the concept of wrapping the body in vibrant, painted brushstrokes. Each digital print or framed scarf starts life as a detailed graphite sketch which is then interpreted into an oil painting and screen print. Leanne Claxton is an artist with a passion for the outdoors, delighting in natural light, alfresco painting and the rainbow of colours and intricate details that nature offers. The paintings and accessories she creates are inspired by these elements at home and on her travels. 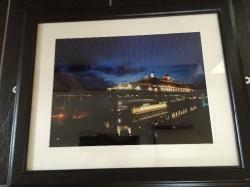 Print measures 12×16 inches with an aperture of 7.75 x 7.25. Phoebe Hill is a self taught artist who works primarily with coloured pencils. 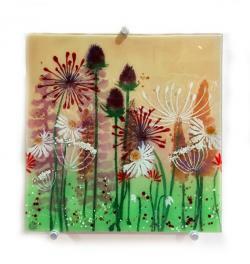 Her inspiration is found in her home town of the Peak District, with its beautiful wildlife and farm animals. 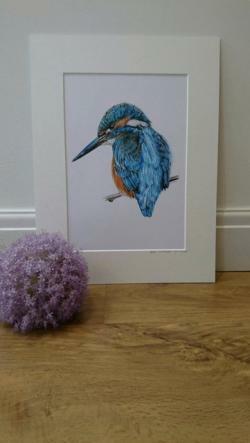 Brian the Kingfisher was named after her Father and inspired by him too. A keen fisherman with the same skill as this bird. He is also among the lucky few to have marvelled at these stunning birds for hours whilst by the river side. Phoebe’s works can also be found on Facebook under her artist page: EstherSea. Being influenced by New Town utopian living, the movement of people and urban aesthetics, Rachael creates abstract notions of architecture and space. Using varying mediums and experimental print, the individuality of each artwork created by the method of printing, contrasts the rigidity of the subject matter and gives a sense of freedom. Materials used within this work have been a combination of juxtaposing the luxurious against industrial, highlighting the stark beauty of urban landscapes and creating a new, imagined identity. 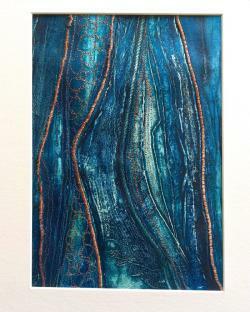 Rachael’s new series of work uses acrylic and metallic pigments. Rachael is also an Interior Designer and Stylist working within commercial and residential venues. If you don't see any of our fantastic art which takes your fancy, we'd love to receive a donation for CRUK. 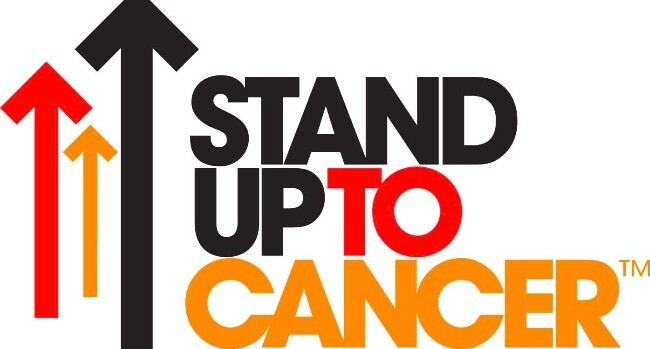 Any amount would be amazing and please don't forget to Gift Aid if you can. Buck the Stag came about after a misty morning spent in the grounds of Chatsworth Estate. 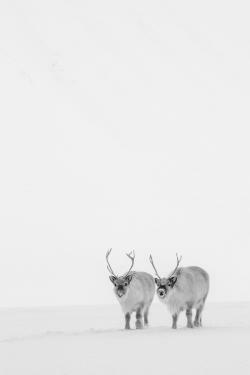 There is something very majestic about these animals and they are Phoebe’s all time favourite. Emily West’s animation Homage to Strogg 2015. Size 40cm x 30cm mounted not framed. Limited edition digital print, 1 of 10. Emily is an artist, educator. She has won several art prizes including the Lumen Prize top 20; the Alcan Art Prize; and the Kate Bentham Art Prize. 1998 Sons and Daughters, Hanover Gallery, Liverpool. 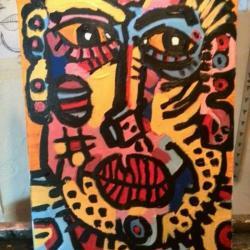 Chris Roberts is an educator and artist. He is currently the Programme Director for Foundation Diploma in Art & Design at Central Saint Martins and is a Senior External Moderator for UALAB. As an artist and maker the work he produces is inspired by a sense of place (or environment), much of the imagery and materials are collected and/or found – a process of selection, careful consideration for composition and assembly are then employed. 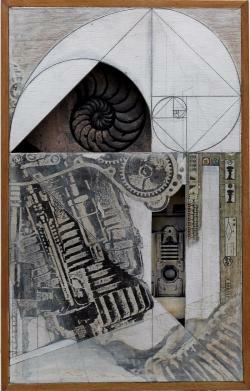 Roberts’ practice encompasses both design and traditional visual arts techniques and processes, and the work in turn takes its references from architecture, structure, texture, surface and materiality. The resulting works occupy a space between two and three dimensions and are both image-based and sculptural. This engenders a process in which discarding and reworking material is integral to the form of each individual piece. 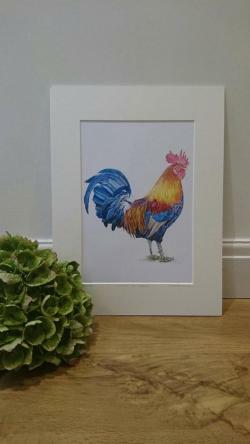 Charlie The Cockerel is named after her late Grandad and inspired by her Grandma. The bright colours and overall beauty are a representation of her Grandma. When stumbling upon the original photograph of Jack the Hare by Simon Litten she was taken back by the beauty in his eye. There was no other option than to draw him. Oil on canvas Size 29.5 cm x 39.5 cm. Dead Not Gone developed from a simple drawing of a dead, withered leaf but soon became an exciting platform for me to let my imagination take hold and experiment with colour. 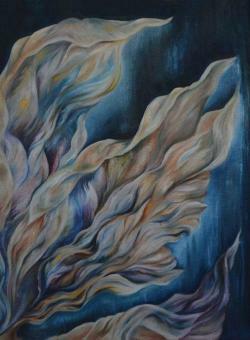 The wrinkled, twisted form enabled me to express a transformative flow of energy and in turn attempt to capture the idea of that energy shifting and passing on. This piece is significant to me as it reminds me that even when something (or someone) has passed, the energy of that being is everlasting and ever-shifting. Georgia Marlow’s art reflects on the sublimity and wonder of nature and how it evokes emotion and memory. Her paintings of natural forms are imbued with imaginative colour so as to express the transformative quality in all things. Georgia is a member of the Cross Street Arts collective (crossstreetarts.com) in Wigan and takes part in regular exhibitions with the group. She currently works from a studio space at their base in standish, Wigan. We will deliver this item personally to ensure it gets to you in pristine condition. This is an amazing opportunity to own a set of three of these newly developed lights – a tantalising tactile bottom. 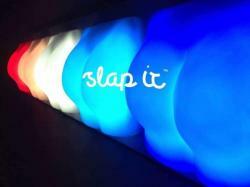 Slap it to turn it on, diffusing a warm glow to light up your room. Use the switch on the back of the light to change the colour. Inventing from a studio in Battersea London, Joseph Begley has been fortunate to have had the opportunity to work with some of the UK’s most established product designers with extensive industry experience. Over the last four years working within this energetic, close knit and collaborative working environment, he has been included in all areas of the design process and gained invaluable experience working on wide-ranging projects. Design and Play Limited is a multidisciplinary design studio, founded by Joseph Begley in 2014 after graduating from Camberwell College of the Arts, London. Slap it has developed over the last two years. Having successfully established personal professional relationships with reliable manufacturers and moulding specialists, the product is now in production and ready for wholesale worldwide. Joe was recently asked to showcase at the Celebrity Gifting Suite in Los Angeles, USA at the Emmy Awards on the 17th September 2016. “We are going to use this unique opportunity to market Slap It, to chat to over 150 celebrities, sharing videos and photos, to obtain huge exposure to millions of people via their social media”. 205mm x 325mm - framed in a box and ready to hang. 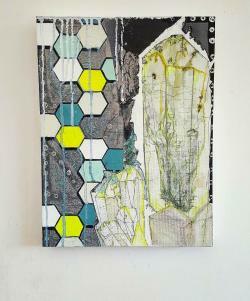 I am a Lancaster based artist working in Ceramic/Multi Media Assemblage, Print, and Drawing. Since the early 1970s, my work has been exhibited in a number of exhibitions in the UK, Europe and the USA. The piece included for auction is from several years ago when one of the main strands of my studio practice was looking at equivalence between manufactured and natural objects. I have a number of recurring obsessions ranging from World War One to concerns about how new and emerging technologies are threatening wildlife and indeed human life in various parts of the world. Image size approx. 34.5 x 21.5cm plus mount 46 x 35.5cm. There’s currently a huge problem in America. The police keep getting caught on film killing unarmed black men. The solution? Make it illegal to film the police! Freddy Fuller is an illustrator from Lancashire, who specialises in portraiture. He likes to think of subtle concepts for his work to give them an extra layer of meaning. 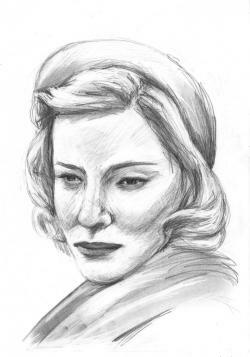 ‘Carol’ was an entry for the Little White Lies portrait competition and uses a combination of soft and rough marks to mirror the emotions within the film. He was recently awarded first prize in the Absolut at New Designers Competition in London with his portrait of Drag King Stormé DeLarverie. He was also first runner-up in the Little White Lies portrait competition. Reg Warwick has exhibited widely in the UK as well as having two exhibitions in Greece and one in Spain. He has works in private collections in England, France, Germany, Greece, Ireland, Spain, Portugal and the United States of America. 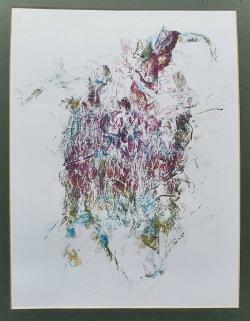 He also has works in public collections in Greece and Spain and two etchings in the Jin Ze Xuan Gallery, Boan, China. 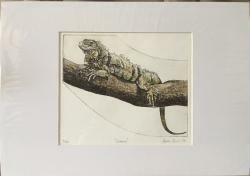 Framed drypoint print with collograph. 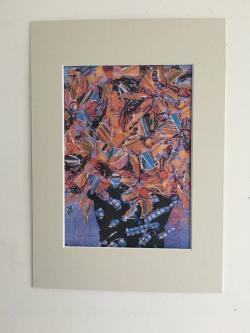 The image is 10 x 10cm, presented in a half inch pine frame with a textured off white mount. 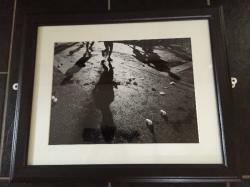 The framed work is 27 x 27cm. This is No. 9 of an edition of 25. It is from Caroline’s ongoing Homonyms print series. Lepus et Capillus is also currently touring the country as part of the Small Print International 2016 exhibition. This is one of two pieces donated by the creative partnership, Pentimento Ceramics and Print. Together Jaki Darlington and Caroline Hewitt create a range of distinctive hand built ceramic work and fine art print. “We produce one – off character driven ceramic animal sculptures and British birds”. Having both worked in Further and Higher Education for twenty years, Caroline and Jaki currently live and work as full-time artists in Glossop, Derbyshire with their two cats Archie and Peter. 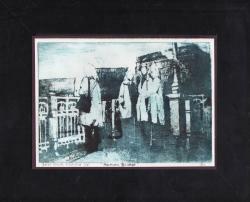 Image size 24.5 x 34.5cm plus mount 46 x 35.5cm. When the lovely people at General Motors realised that their faulty ignition switches in their cars were killing people they had to act fast. They quickly had to do some sums and find out what the cost of recalling all the cars with the faults would be. They also had to calculate how many people they would expect to die if they didn’t recall the cars, and what the cost of the subsequent settlements would be. When the recall turned out to be more expensive than paying off dead relatives they were left with one more calculation to do. Which did they value more? Human life…or shareholders cash? Turns out it was the latter. Poor bastards, imagine how they slept that night. Small Salad / Fruit Bowl. Stoneware with royal blue layered glaze. Size approx. 30 cm in diameter. Danny Smyth is a multi media artist and designer. 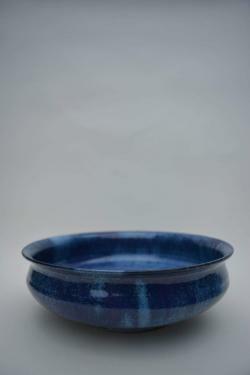 This rich blue ceramic bowl has a wide, open shape and a slight curve at the rim. The surface has a beautiful sheen and the layered glaze includes various shades of blue. This bowl will make a useful salad/fruit bowl or beautiful display piece. Photograph taken in a remote cove near Bude, Cornwall. 38 X 52 cm framed. Wooden frame, deep setting, white frame. "My grandfather was coming to the end of a long battle with cancer during that Christmas, and finding it difficult to bare during my visit, I went down into the cove in the late evening looking for distractions. My practice process was quite complex and elaborate at the time, and I was finding it hard to come up with ideas for new work. The light was going, but the effervescent glow from distant towns kept the sea a light as it began to snow. " This piece is an archive of being between thought, reflecting, and letting everything around you fall into place in perfect chaos. Lee Gray is an artist studying at the Royal College of Art. 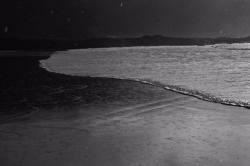 Themes in his work consider states of bipolar in filmic discourse, exploring the indistinct space between elation and melancholy. His work considers filmic, photographic and illustrative forms. 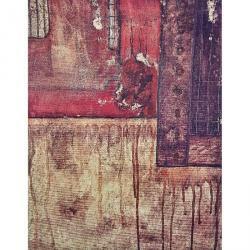 Original Collagraph with free machine embroidery. Mounted and framed in 30x40cm frame. 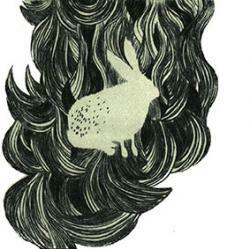 Briony Machin is a ceramicist and printmaker based in Lancashire. Inspired by the beauty of the natural world, her work is heavily influenced by the textures, colours and patterns found in British landscapes, seascapes and natural forms. 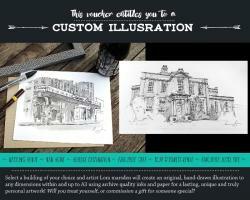 Hand drawn original artwork with a watercolour base and fine liner detail. Liverpool based freelance artist and illustrator Jessica Arrowsmith Stanley, AKA Jazz Stan, works in a mix of media in a diverse range of styles and sizes depending on the client’s tastes. Works vary from large scale murals to small illustrations in order to make artworks catered to their new environment. 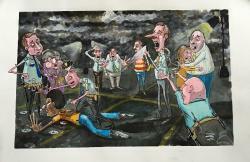 In 2012 Holcroft was selected for the Anna Löbner Düsseldorf exchange. 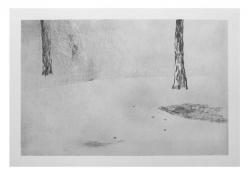 This drawing comes from a series of works produced during his 3 month residency in the city. The drawing was shown in Welcome, Please Take a Seat, a solo exhibition at Atelier am Eck Gallery Dusseldorf. During the residency Holcroft would explore the city composing drawings directly from the urban landscape. These daily drawings would be worked and re worked in the artist studio until finished. Other selected exhibitions include The Grass is Always Greener at the Kunstmuseum Vaduz Liechtenstein. Left Overs,Wasps Briggait, Glasgow. Dibujo Pintura Escultura La Casona Spencer Cuernavaca, Mexico. Getting Lost, ArtTrail Festival Cork City, Ireland. Simon Taylor has been a practicing photographer and artist for over fifteen years. His main areas of interest are documenting life through street photography, and looking at the beauty of the world, no matter how insignificant the subject may appear. Photography has given him the freedom to visually explore his thoughts and ideas. In 2012 he was awarded a first class honours degree in creative arts photography. 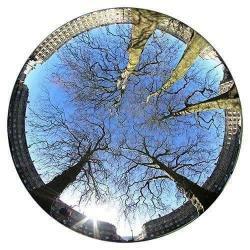 He has had his work published in Bath Life Magazine, Which Digital Camera, PhotoPlus, London Independent Photography and The Bath Magazine and exhibited in several local galleries. He has worked with the Royal Photographic Society, 24 hours in Bristol Festival and Format International Festival. Michael Anthony Walsh is an artist who avoids the confines of one particular discipline and incorporates all disciplines into his work. In this way his sculpture informs his drawing and how he draws will inform his sculpture. Craft and traditional techniques are also vital to his work. Due to various human activities around the world, some species of wild animal have become endangered. Walsh feels that as these animals are a source of his artistic practice, the work he creates should help to raise awareness of their plight. 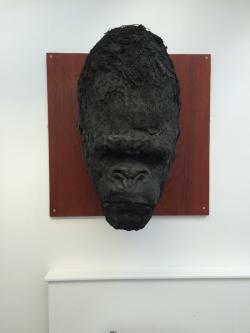 This piece, Gorilla Head was originally part of a full Gorilla sculpture created to emphasise the threats that these magnificent creatures face, on the verge of extinction due to human poaching. Walsh dismantled the sculpture and published a picture of this on social media with the hashtag ‘Create Don’t Destroy’ in the hope that it would shock and remind people of these amazing creatures and the extinction they face today. Liz Gorman is an artist living in London. Her work brings together documentary photography and alternative photographic processes. 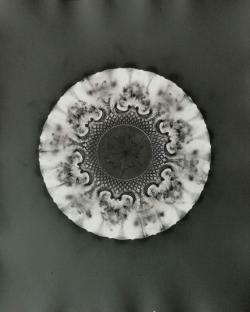 For this piece, a glass bowl is placed directly onto black and white photographic paper and exposed to light. As the light travels through the glass it reflects and resounds through the cut patterns. 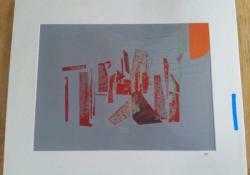 It is part of a series of prints made using discarded glassware collected by the artist. Meadow by Stephanie O’Brien of Morpheus Glass. Signed by Stephanie O’Brien of Morpheus Glass. Morpheus Glass is an established family business owned and run by fused glass Designer/Maker Stephanie O’Brien and Graphic Designer Ian O’Brien. Contemporary design and individuality is the focus, using a range of advanced fusing techniques Stephanie is able to achieve a beautiful, unique and original collection of contemporary fused glass products. Stephanie’s passion for designing and making fused glass is inspired by the exploration of the materials she uses & the effects and textures possible along with combining colours and patterns. As one of the leading glass artists in the UK, Stephanie now supplies fused glass work to galleries, shops, interior designers, architects and independent traders both nationally and internationally alongside exhibiting her work in both solo and joint exhibitions throughout the UK and predominantly enjoys working with clients on a range of bespoke commission projects. Stephanie O’Brien of Morpheus Glass. Conor McDonnell is a 24 year old Photographer from Liverpool, England. He now lives between London and Los Angeles. He travels the world working very closely with some of the worlds biggest musicians and artists. He previously held the title for the ‘Most liked photo ever on Instagram.’ (Kim Kardashian and Kanye West’s wedding) and he was recently named on Forbes’ 30 Under 30 list, in the Arts section, for his Photography. Conor never sells prints so this is a rare opportunity to pick one up! Shaun McAllister is a Photography Lecturer at Blackburn College. He is also a Specialist Social Documentary Photographer who has diversified to include Still Life photography. These photographs have recently been part of an exhibition in Chester. 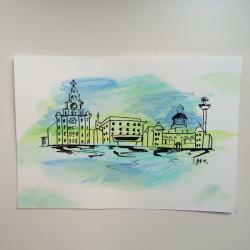 You are bidding on a voucher which entitles you to a commissioned piece based on a building of your choice (a house portrait, wedding venue portrait, favourite destination or other building of interest or sentimental value). 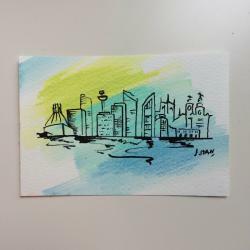 This is an opportunity to create a high quality, unique and personal piece for yourself or as a gift for someone special. The winning bidder will be provided with contact details to discuss your commission! Lora Marsden is a teacher of Art and Design based in Wigan. After studying a BA in Interactive Arts at Manchester School of Art, Lora has continued to develop her own practice, incorporating many aspects of illustration, fine art drawing, graphic design and photography. In recent years she has focused on a series of illustrations exploring places of both personal and local interest as well as creating a number of unique commissioned pieces. Image size approx. 25 x 34.5cm plus mount 46 x 35.5cm. 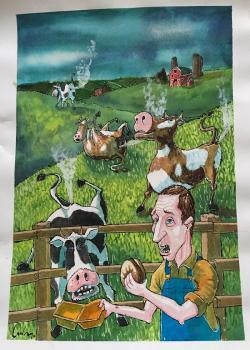 This painting was commissioned as an illustration to support an article which delves into how methane from agriculture has a negative effect on the environment and to support a push to go meat free for 1 day a week. 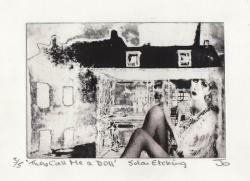 Solar Plate etching. Limited Edition 3/5 21 x 14.8cm. 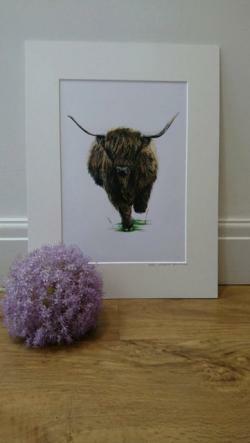 Hazel the Highland Cow (original photography by Dave Ovenden) These wonderful animals are both powerful yet gentle and over 25 hours were spent on the original piece. Jamie Holman is an artist, writer and lecturer. In 2015 Holman began making new works informed by his fathers three tours of duty as a member of the British Army in Belfast, Northern Ireland. Using his fathers photographic archive of “The Troubles,” Holman is currently producing works that explore the similarities in landscape, ephemera and class in both Northern Ireland and Northern England. Works from this collection have been exhibited at The Royal College of Art, profiled in The Saatchi Gallery Magazine Art and Music and most recently have been published in the Aesthetica Art Prize Anthology 2016 – “Future Now,” 100 international emerging artists. Jamie Holman was born in Scotland in 1973 and works in Blackburn where he teaches fine art. 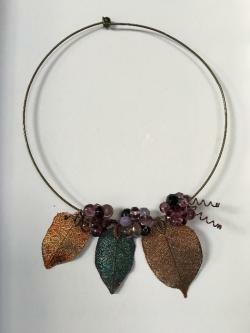 Tansy Wilson is a successful designer- maker creating stunning statement jewellery using a variety of precious and semi precious materials. She writes for Making Jewellery magazine and her work is featured in a number of publications. Li is an ancient Chinese concept which is hard to translate but falls between our notions of pattern and principle. David Wade, in his definitive book on the subject (Li), describes Li as a manifestation of the gestalt, the inherent patterns of things. These prints are based on this idea of ‘Li’, each image conforms to a simple set of rules which become themes on which I have improvised variations. Peter Randall-Page RA is a Royal Academician and an extraordinary British sculptor and visual artist whose connection to nature began in the Sussex countryside. 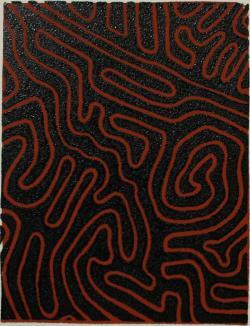 For Randall-Page, organic forms are places to begin, shapes that push the artist to explore his own response to them. During the past 25 years he has gained an international reputation through his sculpture drawings and prints. He has undertaken numerous large-scale commissions and exhibited widely. 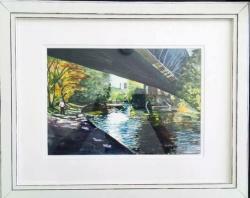 Image size 55 x 39cm Framed size 73 x 53cm Perspex glazed. In my paintings and works on paper I express my continuing fascination with the natural world and man’s relationship with his environment. Rural and urban landscapes in the UK and overseas locations experienced on my frequent travels stimulate my practice. The quality of light, moving through a landscape or finding visual stimuli in surprising locations resonates strongly with me. 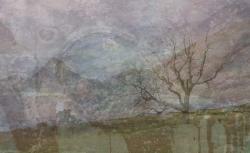 The resulting works develop from memory of a specific experience or location which is filtered through my imagination. 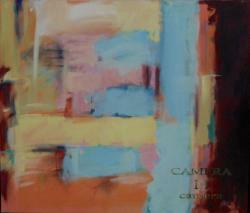 Colour and expressive use of mixed media is central to my working process. I frequently combine collage with wet and dry media to create a tactile response to a particular landscape or environment. 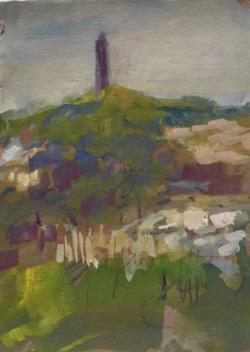 This work is from a series of small studies made on the Channel Island of Sark. 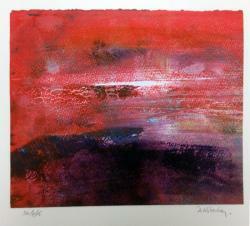 The work aim to capture the changing light and colours of the summer landscape. Andy Sylvester studied fine art painting at Wolverhampton Polytechnic. Since leaving college he has taught fine art at Stourbridge College, where he is currently Department Director for Creative Arts. 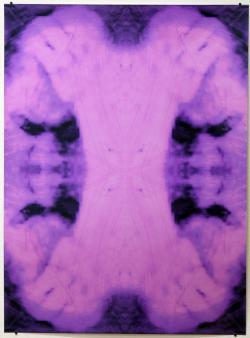 He has exhibited widely and has work in public and private collections in the UK. 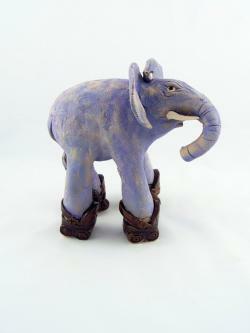 Sid is earthenware with a lilac underglaze and has gold roller-skates. 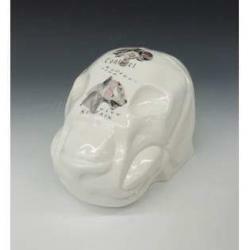 He also has a mouse on his back, glazed with a platinum lustre. Framed print approximately 29.7 x 42cm. Hollie Barton is exploring her dual identity as an artist teacher, subverting paradigms of tradition to examine rebellious textile methods. Weaving and the activity it represents are used to evoke tension and sentiment. Each piece is like a personal detective story, with clues carefully woven into it physically and metaphorically. Hollie seldom starts a piece knowing exactly what it is to be made from, other than the initial feel or essence of mind and material. She sees transforming and layering as a reference for experiential knowledge which has blurred the boundaries of the self. Hollie is a Textiles artist and teacher at Bromsgrove School, Worcestershire. Originally from Merseyside and raised by a family who have always been involved in technical and physical work, there is evidence of her artistic lineage and wider working environment. Weaving is used as a tool to reconstruct and re-invent unorthodox or unwanted materials. This sometimes dictates the ‘personality’ of the pieces as if they evoked a persona of previous histories. 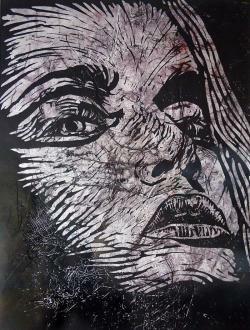 This body of work challenges ideals to work experimentally; techniques such as printmaking are used to illustrate how the traditional can inspire contemporary art practice. Pheasant Phoenix Artwear by Sandy Gardner. Having just been released you have the opportunity to own an Artwear from the first edition print run. The piece comes with a signed first edition authenticity certificate. As one version of the story goes, the phoenix is a bird with plumage of fire that lives up to 100 years. Near the end of its life the bird settles in to its nest, bursts into flames, and the bird and nest turn to ashes. However from those ashes, a new phoenix rises. The rising of the phoenix is said to symbolise that a person has gone through difficult times, beating life’s challenges and has defeated difficult obstacles. Some theories suggested that the myth originated from the bright colours of a flying male pheasant bursting out from the hedgerow and so was born my Pheasant Phoenix. A Pheasant Phoenix rising from the ashes. 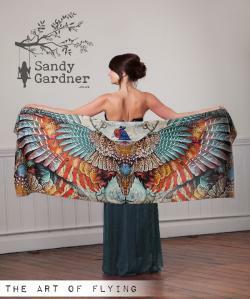 Sandy Gardner’s ‘The Art of Flying’ collection began in the spring, a time of rebirth and renewal. The vibrant energy, the productive nest building activity of birds during this season and their ability to fly and rise above obstacles resonated with me. I aspired to connect myself and others with the positive energy of these birds. I explored ideas based on metamorphosis, merging human form and bird. This flat work did not manifest the relationship I sought to generate, the pieces were too detached from the individuals. A solution came to me, take art off the wall to make it a movable extension of the people. This was the beginning of “The Art of Flying”, a collection of Artwear and artwork featuring full arms length intricate wing expanses inspired by British birds living in local habitats. Each design begins with a combination of pen and ink line drawings coloured with water colour washes. With the meticulous use of a drawing tablet, fine brush details are added. Each design is completed by digitally combining the hand rendered elements with layered fragments of digital photography and collage. My Artwear is made from a lightweight, breathable 100% high end cotton lawn fabric, chosen for its luxurious smooth soft un-textured feel. The fine weave of this fabric makes it possible to achieve high definition vibrant prints. Each piece is prepared especially for you. I check each Artwear thoroughly then carefully hand roll the fabric into a Sandy Gardner Artist slide tube. The beautiful but sturdy packaging can be used to safely store & easily travel with your garment and means there is no need for gift wrapping. Stylised cast ceramic lion head with decals. This stylised ceramic lion head, taken from a series, explores the historic symbolism of big cats in the role of sentinels. Many different cultures inspired this series including the idea of inscribing magical intention onto the surface of an object. Often this was done using Glyphic writing and symbol imagery, so the artist designed her own digital Glyphs to fire onto the surface of the ceramic head. This head is intended as a contemporary sentinel taking direct inspiration from past cultures and the novelty of the Victorian curio. The head, cast mould and decal images were all designed and handcrafted by the artist. The head you will receive will have a decal strip similar to the one in the pictures but it may not be the exact one. Rebecca Barwell is a sculptural ceramicist and image maker based in Lancashire. She is in her early twenties and graduated with a First Class Honours in Contemporary Craft at UCLAN. Rebecca’s work takes inspiration from mysticism, natural history and the Victorian fascination with ‘the curio’. She is currently completing a Ceramic MA at UCLAN were she is exploring animal form within the theme ‘Cabinet of Curiosities’. One of about 30 Doodlism paintings created from a initial series of doodle sketches. Doodlism definition: Accidentally creating an interesting image. 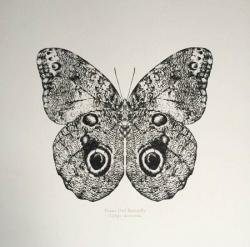 Jonathan is currently the Manager of Butterfly Fine Art, a gallery in the Northern Quarter of Manchester. He has exhibited throughout the North West of England, Germany and in N.Y.C. .
His last solo exhibition, ‘Doodlism’ , was at The Corridor Gallery, at the Bureau Centre For Arts in Blackburn in August 2015. Derived from the Frisian word Landschop referring to a shelf of land shovelled from the sea, the Anglicised version, Landskep, adopted by 16th century mariners along the east coast, seems a more apt term to apply to the wet margins of East Anglia than the more solid, culturally inhibiting ‘landscape’. This photographic print is part of an on-going body of work that has at its core the psychological connections between desire, anxiety and space. Judith Stewart is an artist, writer and curator with an interest in overlooked aspects of the everyday, particularly in relation to rural and domestic spaces. She exhibits nationally and internationally and currently teaches MA Fine Art at Norwich University of the Arts. Black with metallic gold lettering. The illustration is initially hand drawn using fine rotring rapidograph ink pens. 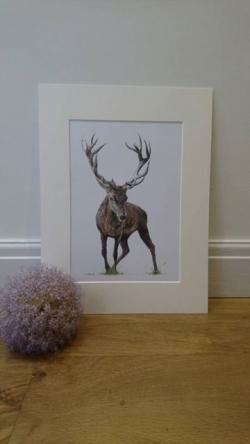 Paige Cartledge is an illustrator and screen printer, specialising in scientific illustrations and natural history. Gouache and watercolour on board. 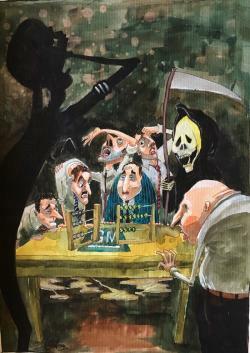 The Survivalist was exhibited in the Contemporary British watercolour exhibition curated by Simon Carter at Maidstone Museum and Art Gallery, The Burton Gallery, Devon and the Oriel Gallery, Antrim, in 2015. James Quin is currently a doctoral candidate on the practice-based PhD course at the University of Newcastle upon Tyne. He has exhibited nationally and internationally, most recently in the exhibition Performing Likeness at Fort Worth Contemporary Arts, Texas. 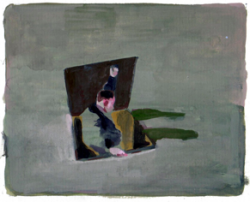 Quin has also shown in the Marmite Prize for painting and the Creekside open, curated by Phylida Barlow. Quin is currently associate lecturer at the University of Newcastle upon Tyne and painting lecturer on the degree course at St Helens. Ink, bleach and pencil on cartridge paper. Size of the work 19 x 28.4 cm. Frame dimensions 33 x 43 cm. Claire Hopwood is an exhibiting artist and lectures at Blackburn Art School. 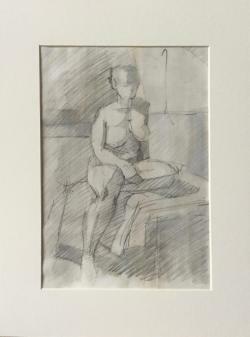 This study is part of a series of five nudes, recently on show in Manchester. 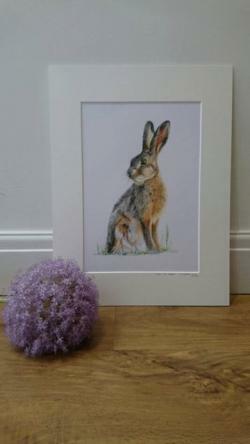 Laura Quinn specialises in oil portraits of wildlife, people and pets. Her work has been displayed in a number of exhibitions across the UK, including the Society of Wildlife Artists’ (SWLA) Annual Show and the National Exhibition of Wildlife Art (NEWA), and has also been shortlisted for the BBC Wildlife Artist of the Year award. Laura has a degree in Mathematics from University College London, where she also studied at the Slade School of Fine Art before gaining her diploma in Foundation Studies in Art and Design. She then went on to study Scientific & Natural History Illustration at Blackpool & the Fylde School of Art and Design, graduating in 2009 with First Class honours. In 2014 Laura reached the grand final of Sky Arts Portrait Artist of the Year and has had two of her paintings hanging in the National Portrait Gallery, London. She was lucky enough to paint portraits of Sir Ian McKellen, Richard Dawkins, Reverend Sally Hitchiner and Ashley Jensen. Laura was also commissioned by the Royal College of Music to paint Dame Kiri Te Kanawa, and her portrait now hangs in the foyer of the Britten Theatre. Laura works mainly with alkyd, a fast-drying oil paint, on board or canvas, and loves the challenge of trying to convey the personality of her subjects through her painting. She lives and works in Wigan, in the North-West of England, and is recently married to Dylan. They share their home with their cat Freda. St. Guilliem le Desert, France. Gouache and pencil on watercolour paper. 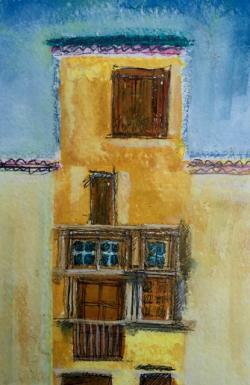 This small gouache and pencil work takes as its source a town house from the medieval village deep in the heart of the Languedoc. The heat of the summer sun as it pours down across the tiny unspoilt part of southern France is captured and felt by the artist. The work comes from a series of twenty paintings. 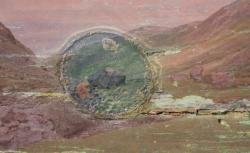 This is a “cache” painting from a series that Neil Horsefield made relating to an exploration of places and events remembered. They are paintings that link in process but are meant to stand alone as prompts for a re-imagining of secret or inaccessible places. At the time Horsefield was keen to leave the type of image making which depicted objects or narratives and deal with an aesthetic that had been nagging away since 1983, when as a student he met Albert Irvin. He says of the work, “If I were to locate it now I would place it between Object Oriented Ontology as a sensual experience and a resistance of relationship for the value of subjectivity in Speculative Realism. It is a positively charged painting and favourite of mine from that time, in memory of the late Albert Irvin”. Gari Wellingham is the online and financial manager of Curating For A Cure. In 2014, Gari saw 3 different GPs in 3 days before ending up in A&E (which he took a bus to get to) before being diagnosed with a rare and often fatal cancerous brain tumour. Gari's book is a personal, very truthful, open, occasionally raw, but hopefully ultimately uplifting account of his experience with Cancer. 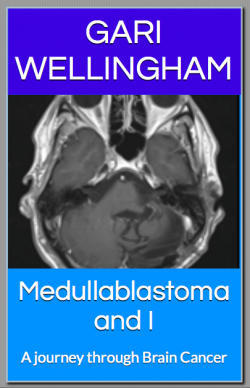 Gari is offering this special Curating For A Cure edition of Medullablastoma and I (A Journey Through Brain Cancer) as a complimentary gift for everyone who has been so kind to visit our auction and considered supporting us. Work on paper, mounted to suit a 12in x 8in frame. Born in 1946, David Stanley, Painter and Printmaker, is based in the north of England. Working almost exclusively in acrylic paint. He has a Master of Arts (MA) degree awarded by the University of Liverpool and is a member of the Manchester Academy of Fine Arts (MAFA). Titles and phrasings too are essential to Thomas’ practice. Certain titles are jokes and witticisms, words to counterbalance the works themselves. Still other titles are autobiographical in nature and used to reference particular moments in time. Others make cryptic allusions to artworks, books or poems. 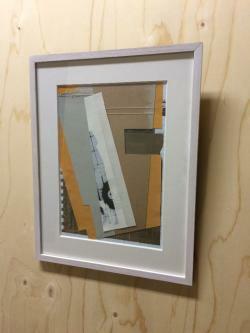 Thomas is keenly aware of and interested in the crossover and relationship between artists and poets, image and words. Indeed, Thomas considers the poem ‘Une Charogne (A Carcass)’ by Charles Baudelaire to be a significant influence. Charlie Godet Thomas (b.1985,London UK) lives and works in London, UK. Having studied a BA in Fine Art (Sculpture) at Manchester School of Art in 2009, he graduated with an MA in Fine Art (Sculpture) from the Royal College of Art, London in 2014 where he was awarded the Bermuda Arts Council Scholarship and the Peter Leitner Scholarship. Recent solo exhibitions include: ‘Torschlusspanik’, VITRINE, London (2015); ‘To Be Is To Do, To Do Is To Be, Do Be Do Be Do’, Telfer Gallery, Glasgow (2015) ‘In Comes the Good Air, Out Goes the Bad Air, In Comes the Good Air’, Cactus, Liverpool (2015) and ‘A Method for Writing/A Method for Making’, BALTIC Center for Contemporary Art, Newcastle, UK (2014). Group exhibitions include: ‘Incunabula’, Norwich Catherdral Library (2015); RCA/ECA Edinburgh Sculpture Court, Edinburgh, Scotland (2015); ‘An evenescent fix’, VITRINE (2015); ‘Escape to a Sparkling Moment’, Bloc Projects, Sheffield UK (2015); ‘Bending Light’, Home-Platform, Bristol, UK (2014); ‘END’, Cactus, Liverpool, UK (2014); Royal College of Art WIP Show, RCA, London, UK (2013) Brussels, Belgium (2012); and ‘Re-interpreting the European Collection’ Bermuda National Gallery, Bermuda Biennial, Bermuda (2012). He was included in DAZED’s ‘Artists we’re watching out for in 2015’ list. VITRINE presented Charlie Godet Thomas’ work at The Manchester Contemporary 2015. Charlie Godet Thomas has just been in residence at Caribbean Linked IV at Ateliers ’89 in Oranjestad, Aruba, and is featured in the current Bermuda Biennial 2016 at the Bermuda National Gallery. He is also commissioned by VITRINE’s programme SCULPTURE AT Bermondsey Square, for the October 2017 public artwork. Please cycles images for information on this exciting piece. 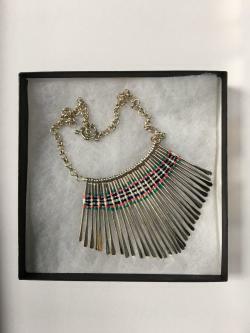 A statement collar using traditional weaving techniques to add a splash of colour. The collar lies flat against the upper chest, just below the neck. Chain and clasp 925 silver plating over nickel free base material. Photo-documentary paperback book (some adult content). Size 14.5 x 21cm. 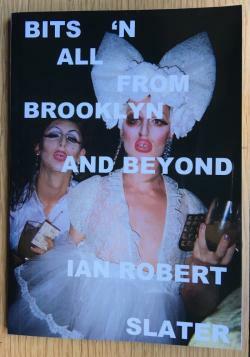 This is the first photo book of Manchester based photographer Ian Robert Slater. He takes us up close and personal with the ‘Beautiful Strangers’ of New York City and shows us how to have a gay old time with the young, fabulous and broke. Bits ‘n all is a fresh fun documentary series embracing the gay culture and life of the big apple. The print entitled ‘Sienna’ is taken from an original oil painting that is an investigation into the traditional offerings to the gods seen in countries such as Bali and Sri Lanka. The beautiful daily offerings are transitory, lasting only a short time, but are art pieces in themselves, representing moments in time, cycles of change. Offerings are made several times a day and placed in front of temples, shrines, houses, offices, shops and even on cars in order to please the gods and also placate bad spirits. ‘Sienna’ aims to capture this beauty in a moment in time and transform these intricate creations into a timeless piece of art.